The graphics look well done, but the effect on each screenshot irritates a little bit. Thanks for the kind words, and sorry if the CRT effect "irritates" your eyes! Animated stuffs will come later, first, because everyone is not on Twitter or Facebook, let's see what happened lately! I'm actually re-working some impacts/explosions sprites for weapons, doing some more boring coding for options & savegames, waiting to inject some awesome soundtracks made by the composer to the game! I'll also work later on a CRT display deform-like shader, because i totally embraced the retro looking of old 90's games! It would be great to see how it looks in motion if you're able to share any gifs/videos. If you plan on turning this into a full game and decide to monetize it, then I would suggest being careful with things like painting over somebody else's work. 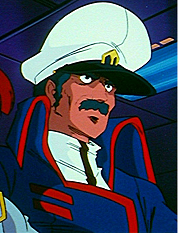 Your commander guy in the screen is pretty recognizably Captain Gloval from Robotech. I'm sure it's just an homage, but it looks more like a recolored version of the original Robotech art than your own art. Anyway, best of luck with the project. I'm a fan of the shoot'em up genre and doubly so of anything influenced by Robotech, so I look forward to seeing how this progresses. Great you spotted him so fast! I know i got to be *very careful* with this type of homage/cameo, but i think that as long as the project stay in its free demo form it should be ok/safe to do so. Hawkwing, even in 1 level, got few others, like the Capcom's yashichi you can see in the 3rd screen of the original post, as i'm glad to refer to what i loved when i was a child! Original arts are credited into the credits tho, but the sprites are not "just" recolored versions, as you can spot if you look closely enough (not talking about colors or insigns). That said, i'll make some gifs to show animated stuffs, but as the demo is only 1 level, i don't want to show too much of it in a full gameplay video! Thanks anyway for your interest! This looks very cool! Tracking. This is so great! I grew up playing this kind of game in the arcades. Sweet artwork! @VertexZero: Thanks dude. Glad you like it. I am REALLY interested :D.
Updated the first post as the Site is now officially LIVE! Good work! I'm really digging the look of it in motion. The upgraded versions of all the weapons look great too. Definitely looking forward to seeing more as this progresses. maybe you could make that CRT effect optional. looks fantastic though, I especially like that flying snake/dragon, are those hairs individual elements? The games looking pretty cool so far. I would love to help out with the music, unless you already have some? @marcgfx: The CRT field in options already exists, but disabled, as i created all the game with it, it's now officially the way it's meant to be played! The "snake/dragon" is made of body parts, and hairs are onto those body parts, not individuals. @sbeast: I've already someone on the audios, but maybe on some next projects! last time we talked about Hawkwing GR3 prototype's weapons (the ship ones), but there's few other mechanics to talk about! First one is the Shield PowerUp; you have to know that one hit kills you in Hawkwing, no life meter, you have to dodge every single bullet and every single collidables. so to help you, you got shield power up acting as a joker. You can stack it two times, cyan for one bonus hit, gold for two bonus hits. Second is the Speed PowerUp; because you could need to dodge more things you can handle (or kill), speed is always the key. Speed ups stack two times too, one shadow ship following your ship for each stack. Next one is the Dodge mechanic; you can dodge bullets and enemies with this dodge, you become invincible for a short time lapse by pushing the [X] button, but can't fire/bomb while in the roll. Ahh, big guns! here comes the Ultra Cannon; the only pickable/carryable weapon of the game ATM, giving you the maximum damage possible, but while you're connected to it, your ship is at 40% of its TOTAL max speed (Speed POW anyone? ), you can't dodge, you can't bomb, or fire with your ship's weapon, nore your modules... you can still "disconnect" from it. And then, the core score mechanic, Multiplicators; in Arcade mode, you play for score. based on your distance with the enemy you hit, you get a score multiplicator for this impact displayed, 2x, 4x, 8x and 16x near melee, so to make better scores, you'll have to take risks! So that's all for this time! Hi, here comes what i was working on for the project lately! I worked on a CRT shader to include rounded shape like old school TVs. And last but not least, i'm refactorizing a lot of code to allow difficulty setting to pass different values to entities/enemies. Don't be shy to ask or comment, feedbacks are importants for me! Thanks, hope to see you in a next DevDiary! Updated the SITE, give it a look if you love shoot em ups!